Great customer care requires excellent communications as customers should remember contacting the customer care department as a compelling experience. In order to achieve such distinguished position in our customers' minds it is needed to obtain systems which support customer communications enable quick - or automated - administration and rapid problem solving processes. xFLOWer's cloud based customer care modules are providing solutions to these business challenges - among many others. Click and learn more! Customer back office bears with at least the same importance as the front office does. Since excellent communications cannot providing solutions to customer queries in case the supporting processes in the background are not in line with front end promises. Cumbersome operations, resulting in slow customer results may destroy customers' opinion about our service or even the company as a whole. xFLOWer's back office modules are offering comprehensive solutions to such business challenges. Click and learn more! Customer care requires large scale document management, which is unimaginable unless documents are attached to business processes. A traditional DMS system is unable to manage business processes, hence making such operations nearly impossible. xFLOWer - thanks to its advanced DMS and workflow engine - provides both functions with robust scalability. Hence, no matter the amount of documents and processes, customer care operations will always flow. Click to learn more! Customer service in almost all cases is the cornerstone of communications with existing customers, especially their requests and problems. Solutions and request completion processes are usually managed in this department thus the vast majority of customers communicated only through this channel with the company, especially in the case of B2C operations. Therefore, customer service quality is determinative to the customers perception about the company. Consequently, customer service is not only a call center, but much rather a set of complex, interdependent processes which comprises of tasks from many organizational units. xFLOWer Cloud provides all necessary software tools to manage and support these processes. In order to achieve and maintain noted brand and company reputation, customer friendly and effective customer service is essential. On the other hand, inappropriate customer communication may damage or in some cases even destroy already built reputation. Customer service management process management and automation results in shorter reaction times and lower customer service workload if these processes are managed comprehesively. xFLOWer Cloud customer service management module provides integrated IT support in decision making, quality assurance and organization of operations alike. All customer service processes are included in the modzule, based on industry best practices. However, these processes can be defined freely step – by - step without programming by using the built – in graphic process editor. Skills and competences of colleagues can be defined while the required skills for all process steps can be determined. Hence, the system is able to delegate the right persons to the tasks fitting their competences - automatically! Event triggered actions are definable in the module, so that if a certain event happens, the system reacts immediately and automatically with starting the processes defined for the given trigger. This automated decision making enables faster and more effective operations while helps to avoid certain mistakes that may occur in the case of human interaction. The system might even inspect different preset criteria such as existing customer debt, complaints, and many others. The module offers possibility to separate customer management tasks within processes. For example, in the case of an incoming customer request that requires both front and back office tasks it is definable which process task is performed by which customer service unit. Consequently, process steps can be separated to ensure added transparency and simplicity. Therefore, workload is distributed evenly among similar positions, always ensuring faster task completion. Also, organization of work in such processes does not require human interaction, that saves human resources for the organization. Quality assurance in case of customer care processes is essential because of the involved direct customer communication. The module enables the implementation of quality assurance policies in customer care processes. Also, based on performance and preset KPIs, the system is able to follow and measure the performance of each coworker on individual levels. While such objective measurements are not exclusive in terms of performance measurement, they provide rational for subjective and more “soft” human evaluation. E-learning function enables tailored development of coworkers by providing an online platform with quizzes, tests, and learning modules that may contain all the knowledge required for personal, professional and organizational development alike. In case of special tasks or jobs it might be essential for colleagues to obtain up to date, thorough knowledge in the subject before start. xFLOWer supports data storage for learning materials, handout and evaluation of these as well, hence providing fast, accessible and measurable learning curves. Based on the previous e-learning functions, organizational level knowledge database can built both from theoretical materials and from feedback of practical experiences. This knowledge base might be accessible online or only through the corporate intranet by request. Those prts of the user interface which will be presented to and accessed by clients (eg. by a corporate online portal) can be designed based on the corporate style guide, thus supporting integrated image and supporting brand image during user self – administration procedures. 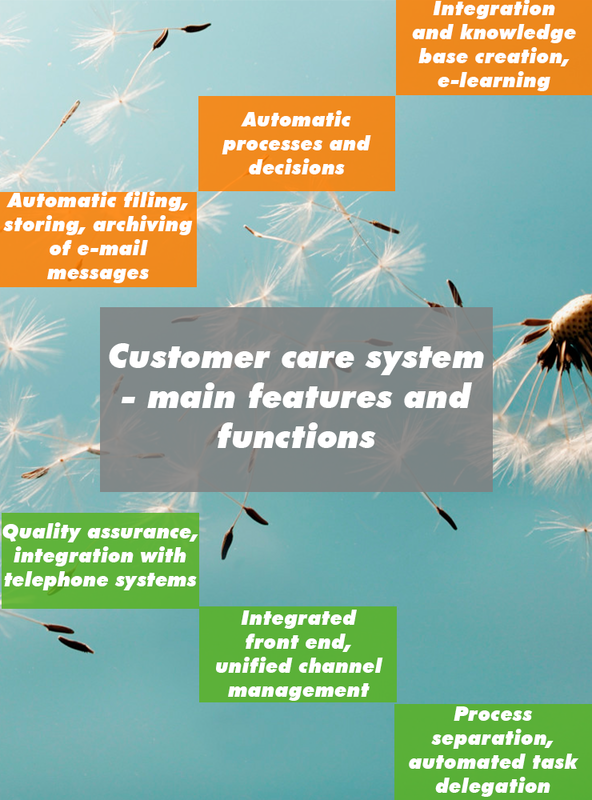 By using integration features, a data connection can be established between telecommunication systems and the xFLOWer Customer Service module. Hence the module receives information about customer phone interactions (eg. data entered through the automated menu system such as personal details, payment details and history, etc.) and relevant data is displayed to telephone clerks. Thus the telephone clerks can immediately see all relevant customer data when picking up the phone, along with statuses (eg. VIP, corporate/personal user, etc.) enabling personalized communication from the firs moment of the conversation. The module observes and categorizes the contents of preset email accounts, and files incoming mails accordingly. Hence it is traceable which email or document belongs to which case or customer. Therefore it is avoidable to accidentally delete relevant documents or emails or have them lost in the mail account. In case of customer communication, this feature can save a lot of inconvenient explanation and apologies towards customers, thus strengthening corporate image and brand. Customer care centers and departments might receive requests through various channels from phone through email, fax and SMS to postal letters. Unified processing of all document types is resolved by xFLOWer, hence all customers might choose the channel most convenient to them and still receive similar administration and processing. Also, confusion deriving from various channel usage can be avoided (eg. lost letters or faxes, accidentally deleted emails, etc.) thus the related processes will not be slowed down or stopped due to the lack of information. All in all, unified channel handling makes easier for administrators to complete their daily tasks while making related processes more transparent and fast. Even the best system can’t provide a complete solution if operational processes are designated erroneously. For this reason, ready – made processes based on international best practices are integrated into all xFLOWer modules, which ensure professional organization of work from the first moment of usage. This unique feature enables business leaders to redefine operational processes solely by appointing coworkers for certain tasks – the rest is done by xFLOWer. xFLOWer Cloud customer management module contains all the above features and enables the definition, management and automation of all operational processes regardless the number of processes, users of documents involved. By automating certain tasks, resources are freed within the organization, hence saving costs, time and energy for your enterprise. Therefore the company is enabled to focus on sales, clients and the constant development of its core competence to retain its competitive edge.